This Italian Life: LIFE: Do You Speak Italian? LIFE: Do You Speak Italian? CHIAVARI, Italy - If you are one of those who stays up nights studying Italian before embarking on your trip to Italy and you still didn’t understand anything when you get here, all I can say is join the club. It happens to everyone. What Italian teachers don’t tell you is that Italians don’t really speak Italian, I mean they do speak Italian of course, but not all the time. Let me explain: what they actually speak is Italian with a sprinkling of local dialect. Venice is a good example. It’s everybody’s favorite city, but also one of the most challenging when it comes to language. Let’s start with the basics – streets. 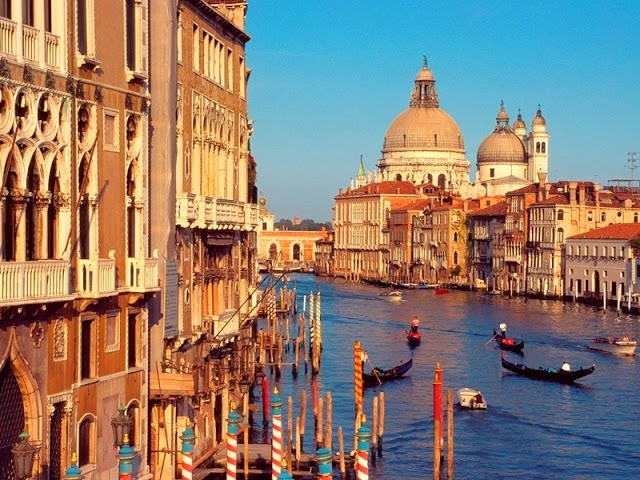 You probably know that in Venice the streets are called ‘calle’. However, if a ‘calle’ is smaller than a regular ‘calle, its called a ‘calletta’. But the ‘calle’ becomes a ‘lista’ if several other ‘calle’ lead into them, for example, the Lista Vechia dei Bari in Cannaregio. And then there’s ‘ramo’. Ramo literally means small branch and it is a subdivision of a ‘calle’. According to the degree of ‘ramification’ there can be a primary ramo, ‘ramo primo’ and a secondary ramo, ‘ramo secondo’. There may even be more. This does not mean, however, that the ‘ramo’ is narrower than the ‘calle’, it can be exactly the same width, or it may be longer, or then again it may be shorter and there is no rule saying it can’t end in a dead end, which apparently many do. Now, if the street has a lot of boutiques and cafes on it, it is neither a ‘calle’ or a ‘ramo’, but a ‘ruga’, from the French word for street, ‘rue’. And let us not forget the ‘calle stretta’, ‘calle larga’ and ‘calle lunga’, the calle narrow, wide and long, just in case none of the other names are descriptive enough. And, less you think it ends there, it doesn’t, for there are also the salizzada, or salizada with only one z, which means “street selciata”: the streets that were the first to be paved with cobblestones. Why they think it is important to know this is completely beyond me. And what ever happened to plain, old, reliable strada? 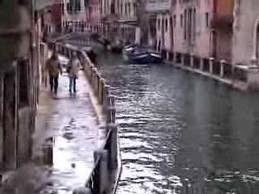 It’s here too – but in Venetian it means ‘a broad street’ and there is only one of those in Venice: the Strada Nova in Cannaregio. While we are on the subject of walking around Venice, there are more than ‘calli’, ‘rami’. ‘ruge’ and ‘salizzada’ to walk on, you can also walk along the ‘fondamenta’. 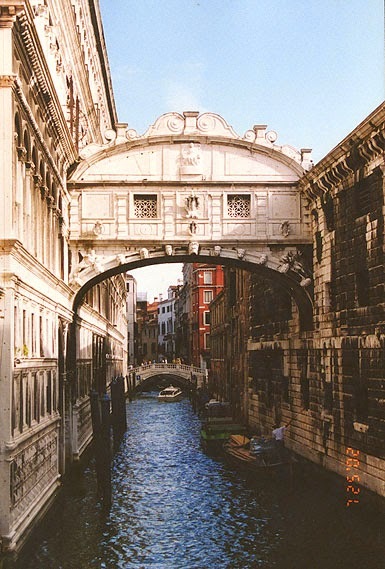 While ‘fondamenta’ means foundation, like the foundation for a building in standard Italian, here it means a walkway along a canal. That is unless the ‘fondamenta’ is in front of a wide expanse of water, like the ‘bacino’ di San Marco, then it beomes a ‘riva’. Are you still with me? Okay then. A ‘fondamenta’ runs along a ‘rio or rii (in the plural), which are what the many small canals are called. A ‘rio’ is seldom straight and most likely edged with houses and is not a canal. The word ‘canal’ is reserved for the three large canals of Venice, the Grand Canal, the Canal of Cannaregio and the Canal of Giudecca. So if a ‘rio’ is a small canal, what, you might ask, is a ‘rio terrà? Easy peasy. A ‘rio terra’ is a ‘rio’ that has been filled in with terra (dirt) to create a street, but of course it can’t be called a street because …… I have absolutely no idea. 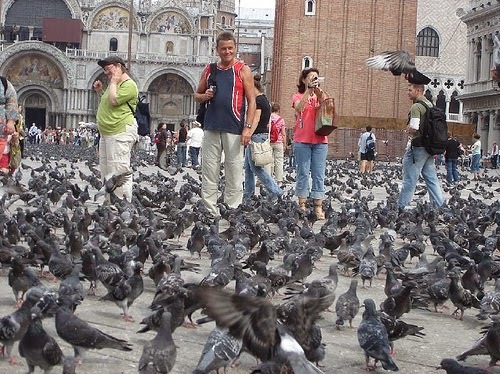 Anyway, as you make your way through the maze of pedestrian walkways, call them what you will, crossing many of the 460 bridges that connect the sixty separate islands that make up the city of Venice, you will at some point cross Piazza San Marco. It is the only piazza in Venice, and it connects to the only ‘piazzetta’. The ‘piazzetta’ goes from the Dodge’s Palace to the ‘bacino’ of San Marco, where in other times, prisoners were hung, right out there between the two columns that are just standing there like nothing ever happened. And while the locals waited for the executions to begin, they would shop or have a cup of coffee and visit with neighbors. 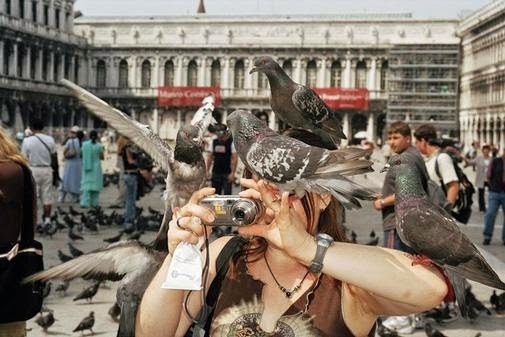 Today, it’s where all the tourists feed the pigeons and then take photos of themselves feeding the pigeons. All the other squares that would normally be called piazza in almost any other Italian town, are called ‘campi’ here, or, if they are small, a ‘campiello’. But hold on, Venice wouldn’t be Venice if there were only four names for the same thing. We can’t just have ‘piazza’ and ‘piazzetta’ and ‘campo’ and ‘campiello’, there must be more. What about the open spaces that are in-between? Ahh yes, the spaces in between. The ‘piazzale’. Fortunately for us there is only one, and you’ve already crossed it if you arrived in Venice by train for the station is in Piazzale Roma. But don't despair. All those hours spent trying to figure out why every Italian verb has to have six different forms, and trying to wrap your head around tenses that don't exist in English, really will pay off in the long run. There are other towns to visit, charming towns, lovely towns. Just be aware that in Milan a room is sometimes called a locale and in Genova it's called a vano, while in ....... well never mind, you'll figure it out.